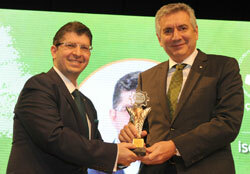 Winners of the 14th Environment and Energy Awards have been announced by Istanbul Chamber of Industry (ICI). Top winners were Eczacıbaşı, Kaleseramik, Kordsa Global and Vestel Elektronik. During his speech at the award ceremony, ICI Chairman Erdal Bahçıvan said: "Our motto is 'Those who destroy the environment destroy their own future.' Together we have to work hard to create a greener, cleaner and more livable environment, bearing this fact in mind." 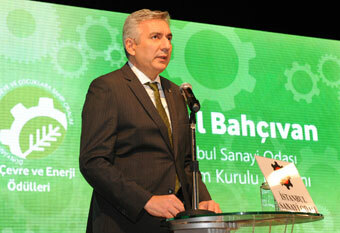 14th Environment and Energy Awards Ceremony organized by Istanbul Chamber of Industry (ICI) took place in ISOV Akatlar Vocational Training Complex. A total of 18 awards from five categories were given during the ceremony. "Innovative Environment Friendly Product" award went to Kordsa Global with its resorcinol-formaldehyde-free dip technology while chrome coating system earned Vestel Elektronik the "Environment Friendly Application" award. Kaleseramik won "Energy-Efficient Application" thanks to its recycling projects while Eczacıbaşı Yapı Gereçleri Sanayi won first place in "Environmental and Sustainability Management" category. Enel Enerji Elektronik received Special Jury Award in the "Energy-Efficient Product" category. Net Pak Ambalaj won Special Jury Award for SMEs in "Innovative Environment Friendly Product" category while Artaş Endüstriyel Tesisler received Jury Encouragement Award. Alongside Erdal Bahçıvan, Chairman of the ICI Board of Directors, the ceremony was attended by Hasan Büyükdede, ICI Vice President of Assembly; İrfan Özhamaratlı, Vice-Chairman of the ICI Board of Directors and Board Members Nahit Kemalbay, Sultan Tepe and Ata Ceylan. Prof. Mustafa Öztürk, Undersecretary for the Ministry of Environment and Urbanization was also present at the award ceremony. During his speech, ICI Chairman Erdal Bahçıvan stated that global climate change and environmental impacts of rising energy consumption were of critical import today and that they intended to sustain awareness on the issue. He emphasized the necessity to focus on long-term and effectual policies. He added: "Our motto is 'Those who destroy their environment destroy their own future.' Together we have to work hard to create a greener, cleaner and more livable environment, bearing this fact in mind." Bahçıvan referred to activities in the European Union (EU) in environmental and energy awareness and underscored the fact that between 2010 and 2012, 45 percent of EU companies operating in industrial, agricultural, water and food services were eco-innovative. He also laid emphasis on the high-saving aspect of cyclical economy which hardly produces any waste and reuses raw materials through closed loop recycling. "According to the EU Commission, cyclical economy will yield 600 billion Euros in savings by 2030. What we need in Turkey is legislation that enables and facilitates waste or product transformation." Bahçıvan also added his opinions on water and energy saving, top items on the world agenda: "Turkey is not a water-rich country. Consequently, the industrial sector may not find water for production due to the priority given to potable and domestic water in view of social dynamics in consumption of water resources. The fight against climate change is also closely linked to energy policies. The rate of coal, oil and natural gas in global energy supplies is still around eighty percent. These fossil fuels are the real culprit of global warming. Reality is as such but unfortunately it is assumed that fossil fuels will continue to be the main energy resources in the coming years. Energy-efficient technologies that reduce fossil fuel consumption will create significant outcome for the prevention of climate change." Prof. Mustafa Öztürk, Undersecretary for the Ministry of Environment and Urbanization, also gave a speech at the ceremony during which he underlined the Ministry's stance against the storing of hazardous waste. "There is no such implementation within the EU. We have to eliminate these wastes in cooperation with non-governmental organizations such as the ICI." 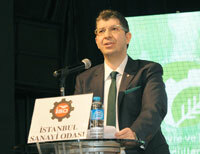 Öztürk also pointed out to 2015 as a turning point in the reduction of greenhouse gas emissions. "A new era is dawning in this field. China and the USA, top two countries responsible for global greenhouse gas emissions, have brokered a deal but they have not publicly announced it. We as ministries and industrialists have to join forces to come up with policies in this field." M. Ata Ceylan, Member of the ICI Board of Directors and Environment-Energy Boards Chairman, evoked ICI's efforts for the environment since 1987, in the absence of Ministry of Environment in Turkey, "We as responsible industrialists concern ourselves over the protection of environment. It is important to generalize energy efficiency, the most applicable tool for the business world in its fight against climate change. It is imperative that the state support the investments of companies in this area." Products and projects of companies in 2013 competed during the event henceforth entitled Environment and Energy Awards, organized by the ICI since 1995. The jury consisted of the Representative of Provincial Directorate of Environment and Urbanization, industry representatives and academics from departments of environment, environment institutes and research centers of universities. The jury examined in detail the environmental activities of companies and laid major emphasis on activities following greenhouse gas emissions that cause climate change. Large Scale Enterprise Environmental and Sustainability Management First Prize Eczacıbaşı Yapı Gereçleri San. ve Tic. A.Ş. 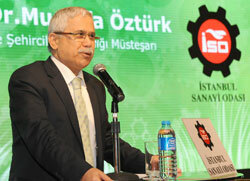 Large Scale Enterprise Environmental and Sustainability Management Second Prize Ford Otomotiv Sanayi A.Ş. Large Scale Enterprise Environmental and Sustainability Management Third Prize Otokar Otomotiv ve Savunma San. A.Ş.